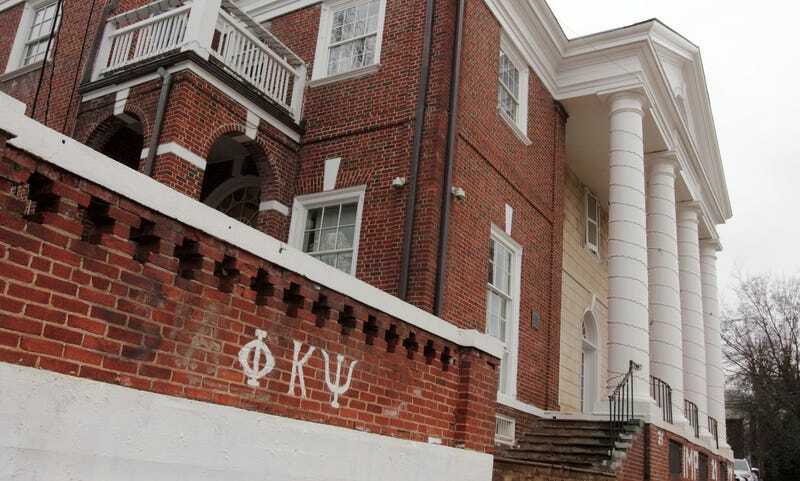 On Friday, Rolling Stone announced in a note signed by managing editor Will Dana that in light of new information, they had concluded there were serious "discrepancies" in the account of Jackie, the University of Virginia student who told journalist Sabrina Rubin Erdely that she was gang-raped during a 2012 party at the Phi Kappa Psi fraternity. As every media outlet in the known universe pores over Rolling Stone's missteps in this story, they're continuing to make them: over the weekend the magazine quietly changed their editor's note on the story, removing a widely-quoted line: "[W]e have come to the conclusion that our trust in her was misplaced." Meanwhile, a conservative blogger has released what he claims is the real name, address, phone number, and picture of "Jackie." (At the same time, I've gotten a lot of well-deserved criticism for a salty post I wrote defending Erdely from Reason's Robby Soave and Worth's Richard Bradley — formerly Richard Blow, before he changed his name during his own brush with bad publicity). In the meantime, the Washington Post also quietly removed a key claim from their own scathing report on the UVA story. That means neither Erdely nor Rolling Stone has yet commented on two important details about their handling of the story: their decision to use Jackie's real first name, and Erdely's alleged refusal, outlined in the WaPo story, to remove Jackie from the story when she asked: "Overwhelmed by sitting through interviews with the writer, Jackie said she asked Erdely to be taken out of the article. She said Erdely refused, and Jackie was told that the article would go forward regardless." This is a request that sources make all the time, usually late in the reporting process, when it becomes clear that a story isn't going the way they'd hoped or won't cast them in the light they wished. Erdely wasn't, strictly, under any obligation to take Jackie out of the story, although it might have made most reporters wonder whether she was the best person to hang the story around. Jackie's reluctance is, at the very least, something she should have noted, along with her evident agreement with the girl not to contact her alleged attackers. Jackie's suitemate her freshman year has written a letter to UVA's student paper, saying strongly that she doesn't believe the girl made up her story: "I fully support Jackie, and I believe wholeheartedly that she went through a traumatizing sexual assault," she wrote. She says it was Jackie's mistrust in Rolling Stone that was misplaced, not vice-versa, and adds: "[T]he articles released in the past few days have been troubling to me, and the responses to them even more so. While I cannot say what happened that night, and I cannot prove the validity of every tiny aspect of her story to you, I can tell you that this story is not a hoax, a lie or a scheme. Something terrible happened to Jackie at the hands of several men who have yet to receive any repercussions." There are still a great many questions to be answered here, ones Erdely should step forward and address directly. In the meantime, Politico reports that UVA's fraternities and sororities are planning a "sweeping offensive" against the school, asking that the suspension of the Greek system be lifted and complaining that the story cast them in an unfair light: "Greek leaders say they would like the university to apologize, publicly release records that explain the basis of its decision to suspend the Greek system and outline how it will restore the reputation of fraternities and students at the university."